I’ve been mentioning for the past few months that another mortgage stress test was en route. Sure enough, like clockwork, OSFI- the watchdog of financial institutions gave the green light on another 2% stress test. This time the stress test was focused on uninsured mortgages. Today’s revisions focus on uninsured mortgages, after omitting them on the previous stress implemented back in November, 2016. The previous stress test created a scenario where highly leveraged borrowers desperate to enter into the housing market began bundling mortgages and seeking out private lenders in order to bypass the stress test. 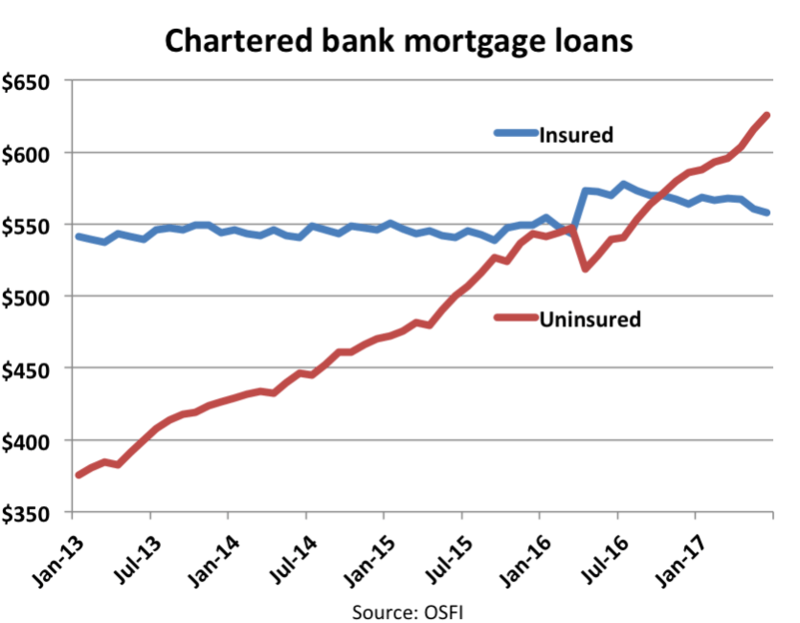 In fact, as of August 2017, insured loans dropped 4.5% year over year, while uninsured mortgages exploded by 17.3%. What Are the New Mortgage Rules? Now all borrowers will be subject to a new minimum qualifying rate, or “stress test,” for both insured and now, uninsured mortgages. This means regardless of whether you’re putting down 5% or 25% you will need to pass the required stress test. The new guidelines require the minimum qualifying rate for uninsured mortgages to be the greater of the five-year benchmark rate published by the Bank of Canada (currently 4.89%) or the contractual mortgage rate +2%. In other words, if you secure a 5 year fixed mortgage at 3.09%, the amount you’ll be able to borrow will be assuming a rate of 5.09% even though you’re technically still borrowing at 3.09%. This ultimately helps mitigate risk in the event of a housing downturn while creating a much safer lending environment. However, per estimates from Better Dwelling, it could reduce borrowing power by as much as 25%. Huge. Mortgage bundling, which several lending institutions have been using to circumvent loan to value limits will now be prohibited. What exactly is mortgage bundling? Basically under the previous rules if you had a first mortgage greater than 80% of the property value it had to be insured. So in order to avoid that stress test, mortgage specialists were splitting it up into two loans. That’s a big no no moving forward. The updated stress test will be effective January 1, 2018 and is likely to reduce borrowing power by up to 25%. This could create one last panic to enter the market prior to the new changes. Yes, Canadians will do anything to buy a home. This could also include a rise of risky private loans. Which can charge upwards of 6% depending on the borrower. With the size of mortgages shrinking this could push buyers down a rung and perhaps increase the demand even further at the entry level. Will studio and one bedroom apartments get even hotter? We’ll have to wait and see how the market digests the changes. Implementation of new policies generally have a lag effect, I suspect we won’t know the severity of the changes until mid 2018. But a slowdown in credit is generally a negative on house prices. One last thing, this stress test does not apply to credit unions which are provincially regulated. This will surely push many buyers over to the credit unions, however, we’ll have to see how credit unions react. From what I understand many are trying to curb volume and mitigate exposure to the housing market. Borrowers re-upping for a new mortgage will not be subject to the stress test unless they switch lenders.